On Labor Day in 1957, the lives of a disc jockey, a teenage girl, and a rock ’n’ roll star intersected for a few hours in Portland, Oregon. After that day, they went separate ways, each never again meeting the other two. For the girl, it remained a never-to-be-forgotten memory of her youth. The DJ moved on to a Hall of Fame broadcasting career, but always remembered that unique moment in 1957. And the rock star? No doubt for him memory of that particular Portland meeting was lost in the flood of countless such encounters on his journey to becoming the greatest entertainer of his era. 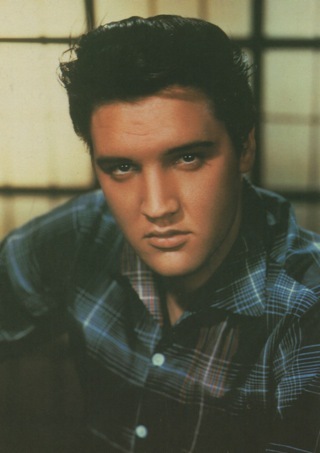 January 8, 2010, would have been Elvis Presley’s 75th birthday. That same day, Bob Blackburn, the DJ who Elvis met in Portland in 1957, died of pneumonia at the age of 85 in Issaquah, Washington. Many obituaries on the Internet focused on Bob’s 20 years as the play-by-play broadcaster for the Seattle Sonics in the NBA from 1967-1987. The obscure encounter with Elvis in 1957 went unmentioned in the death announcements. Portland, Oregon, September 2, 1957. I learned of Bob Blackburn’s connection with Elvis while doing research in 2005 for my book, Elvis ’57: The Final Fifties Tours. A 1999 retrospective article about Presley in the Portland Oregonian mentioned that Blackburn, a DJ on KEX radio in 1957, had run a “Why I Want to Meet Elvis” contest, and that he and the contest winner, Nancy Welty, had met Elvis at his pre-concert press conference in Portland on September 2, 1957. I then set out to find both Bob and Nancy, hoping to interview them for my book. My online search led me to Bob Blackburn, Jr., who graciously put me in touch with his father, who was then semi-retired and living in Bellevue, Washington. On November 7, 2005, I had a long telephone conversation with Bob. I later found Nancy Welty by checking the Salem phone book. Nearly 50 years later she was still living in the town she grew up in. After talking with both Bob and Nancy, I realized that on the surface their Elvis encounter was really no different than hundreds of others in 1956 and 1957. Once Elvis became a national phenomenon, Colonel Parker decided Elvis should hold a press conference in each city he played just prior to going on stage. To boost Elvis’s image with young people, Parker invited fan club officers, radio station contest winners, and high school journalists to the press conferences. After the press finished questioning Elvis, the young girls lined up to meet Elvis, get a kiss, and have their pictures taken with him. Nancy Welty’s encounter with Elvis on September 2, 1957, followed that pattern. Her parents drove her into the city from Salem and rendezvoused with Bob Blackburn in front of the Multnomah Athletic Club. Nancy and Bob entered and took their seats for Elvis’s press conference. Afterwards they had their opportunity to meet him. The encounter was brief, as Nancy remembers it. “He just said hello and what’s your name and that sort of thing, and then they posed us for pictures. Then he gave me a kiss and then you were kind of on your way.” Bob and Nancy then walked to their front row seats for Elvis’s show in Multnomah Stadium. Later Bob obtained two 8” x 10” prints of him with Nancy and Elvis. He sent one signed print to Nancy, along with an apology for not being able to get Elvis to sign it also. He kept the other print. Over the ensuing decades of Bob’s successful broadcasting career, many other pictures were added to his collection. 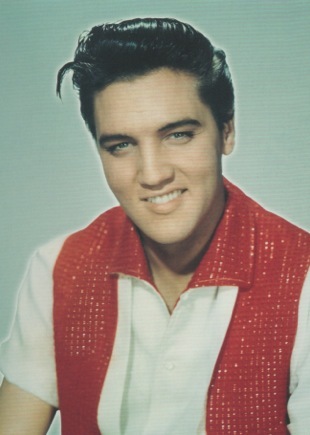 But it was always the Elvis photo that stood out, as he explained in our 2005 phone conversation. 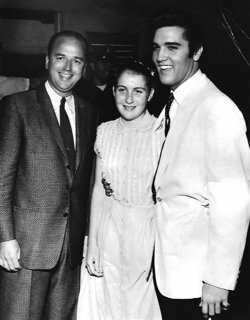 While Bob’s fame later came in the area of sports broadcasting, he obviously appreciated the opportunity being a radio DJ gave him to meet Elvis Presley in 1957. “He LOVED telling that story,” Bob Blackburn, Jr., recalled. As for the photograph with Elvis, it became a Blackburn family heirloom. Back in 2005, Bob told me the original would be going to his son, Bob Jr. “I’m going to be giving a copy of the picture to the rest of my children for Christmas this year. I know that they all want one, so I want to make sure that they get it.” Bob Jr. confirms that his father did give him the original print and had copies made for his other five children and his wife, Pat. “It is one of my most prized and valued possessions,” Bob Jr. says of his father’s photo with Elvis. With the image now passed on to his children, the story of Bob Blackburn’s encounter with Elvis Presley will no doubt be shared with Bob’s 19 grandchildren and passed on to family generations to come. Although Bob Blackburn’s brief meeting with Elvis Presley can be seen as just an interesting incident in a long and successful life, it’s a good example of how Elvis affected the lives of so many people with just a passing encounter. There are thousands of others who have had similar experiences, and Bob Blackburn’s passing is a reminder to those with Elvis stories to tell that they should document them in some manner before it is too late. "Every afternoon I would play all of the top songs. And quite often, if Elvis had a hot one, I’d play that every day."